How do you solve a problem like understanding Iraq? For Hanna Batatu, the solution to this conundrum lay in generating alternative possibilities that effectively side-stepped the conventional wisdom of the time. Historians had long held that Iraq – like other artificial creations of ex-colonial European powers, who drew lines onto the world map that ignored longstanding tribal, ethnic and religious ties – was best understood by delving into its political and religious history. 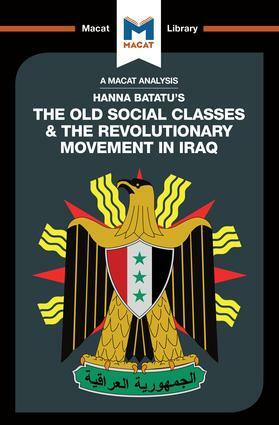 Batatu used the problem solving skills of asking productive questions and generating alternative possibilities to argue that Iraq’s history was better understood through the lens of a Marxist analysis focused on socio-economic history.The Old Social Classes concludes that the divisions present in Iraq – and exposed by the revolutionary movements of the 1950s – are those characterized by the struggle for control over property and the means of production. Additionally, Batatu sought to establish that the most important political movements of the time, notably the nationalist Ba'athists and the pan-Arab Free Officers Movement, had their origins in a homegrown communist ideology inspired by local conditions and local inequality. By posing new questions – and by undertaking a vast amount of research in primary sources, a rarity in the history of this region – Batatu was able to produce a strong, new solution to a longstanding historiographical puzzle. Dr Dale Stahl holds a doctorate in history from Columbia University for research on the politics of Iraq between 1920 and 1975. He currently teaches in the College of Liberal Arts and Sciences at the University of Denver, Colorado.